We're back! We were in Myrtle Beach for a little family vacation for the past week - I'm sorry to have been so silent and not made many comments (blame my husband's laptop with the dumb built-in mouse that is so difficult to use!) - but I had a ton of fun reading all the comments you left for me - I promise to try and catch up over the next few days! 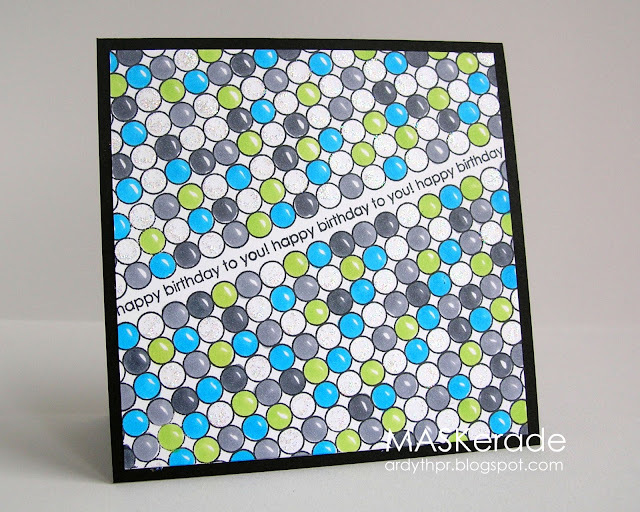 Here's yet another card in this colour combination - I just love it! I think I'll send this one and the one from last week to my twin nephews, who are turning 6 in November. I like to make them matching, but different cards, if you know what I mean. This card uses exactly 2 Papertrey stamps. And some Copics and Stickles, of course! Incredible. The coloring is to die for! Hope you had a fabulous vacation! Sweet, bubbly and cheerful! These colors are perfect for a young guy card. Awesome stamping! WOWSAH! You did some serious coloring on this fun number! It looks great! I love your first Halloween card too! Super cute! I hope you had a fantastic vacation - it's the perfect time of year for that! You COLOURED all of those bubbles!!! Wow. Awesome effect for all that effort! LOVE this! Super pretty and stunning! I love the colors! Bubbles ... that's brilliant!! I have those circles and never though of bubbles. Such a different look. Love it! oh I absolutely love this Ardyth. Seriously, dude. You have the patience of a saint but it's so worth it! Love this!